BAKU, Azerbaijan, April 19, 2012 (ENS) – An award-winning Azerbaijani journalist is in hospital in Baku suffering head injuries when he was severely beaten while filming workers attempting to demolish homes in a long-running land dispute involving the state-owned oil and natural gas corporation of Azerbaijan. The April 18 attack on Idrak Abbasov came just three weeks after he received a prestigious award for his journalism at a Guardian newspaper Index on Censorship ceremony in London. 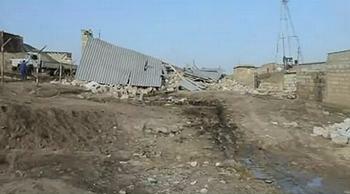 Abbasov, who reports for the Ayna and Zerkalo newspaper, the Institute for Reporters’ Freedom and Safety, and the Institute for Wwar and Peace Reporting, was beaten after residents of Sulutepe, just outside Baku, blocked a major road in protest against the demolition. It was the latest round in an ongoing campaign to remove homes from land which the State Oil Company of Azerbaijan, SOCAR, says belongs to it. In previous incidents, local homeowners say they have been assaulted by security guards accompanying the demolition teams. Roman Abbasov, one of Idrak’s brothers, said the workers spotted Abbasov filming them. “They took the camera, threw him to the ground and started kicking him. He was covered in blood, his head smashed up, and one eye closed over,” he said. “My brother Adalat and I threw ourselves upon Idrak to cover him. Then they started beating us,” he said. Other journalists who heard about the attack rushed to the scene, among them Esmira Javadova, who reports for Radio Liberty. 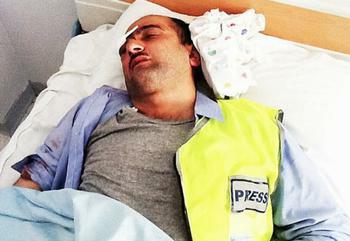 Abbasov and other who had been injured were taken to the Baku’s main hospital, accompanied by a group of journalists. “We spoke to the doctors, and they said Idrak had damage to his skull and brain and was now in intensive care,” Seymur Kazimov, a close friend of Abbasov, said. Hospital doctors told IWPR that Abbasov’s brother Adalat was also in serious condition with head injuries and broken ribs. It is not clear how long they will require treatment. A spokesman for SOCAR, Nizamaddin Guliyev, said he knew nothing about the clash but promised to look into it. “I heard about this incident from a journalist. I was in a meeting. I will look into the matter and give you an answer,” he said. 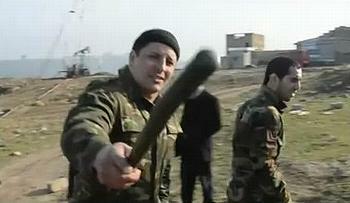 Orkhan Mansurzade, a spokesman for Azerbaijan’s interior ministry, said an investigation was already under way. Media rights activists said the assault on Abbasov came within a wider context of recent official statements equating criticism of the country with support for Azerbaijan’s enemy Armenia, in other words, treason. On March 28, Abbasov was awarded the prestigious Guardian prize for journalism at the Index on Censorship awards ceremony in London. Judges citing the work he had done to expose attacks on private property, and the violence he had suffered in the course of his work. This is the second time in recent months that Abbasov has been targeted. Several of his family members were hospitalised last year in an assault on their home, which is located in Sulutepe but is not subject to a demolition order. 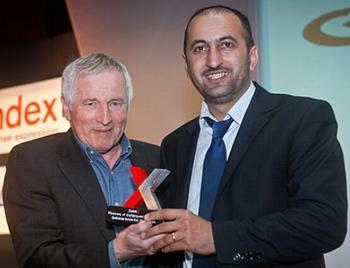 Idrak Abbasov, right, receives the 2012 Guardian Index on Censorship award from British broadcaster Jonathan Dimbleby, March 28, 2012.